And I’m excited because it makes my lesson planning much easier. It’s amazing how many Valentine’s crosswords, puzzles, and word searches are out there, waiting to be used as time filler in my classrooms. Oh, and my lover. We’re real excited about Valentine’s Day too. He’s totally going to get me flowers and chocolates and take me to a restaurant where the appetizers have artichokes, the entrees are unpronounceable and the prices don’t have decimal places. I’ve always loved this photo of my friend Shawnie. It cracks me up. I don’t even remember who it was meant for. Why is it easier to do the hoola hoop on your arm than waist? Once the perfume oils are collected, they are ready to be blended together according to a formula determined by a master in the field, known as a “nose.” It may take as many as 800 different ingredients and several years to develop the special formula for a scent. Wouldn’t you love to tell people that you’re a “nose”? You’d get to utilize the quotations fingers every time you said it. That, in itself, makes the profession a worthwhile pursuit. In high school, I read Parfum, a bizarre story about a serial killer who kills young virgins to capture their scents for his perfume. It’s rather a disturbing read. 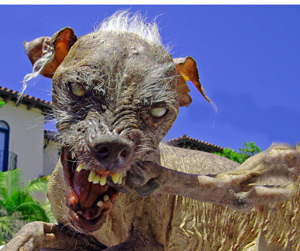 There is a World’s Ugliest Dog contest in Petaluma, California. Meet Sam, who won from 2003-2005. I would go with scary over ugly on this one. i remember who the picture was for…hehe. Furthermore: your post about Valentine’s Day just made me sad again about…well Valentines Day and loneliness and all that. So no thank you for that. But I love you, overall, super duper much. Me too 😛 p.s. I have family in Petaluma. Natty – OK, I kind of think I know who it was to. Maybe. Christophe…I would feel bad for you if I didn’t have a list of your “women who aren’t girlfriends but who would be really mad if they found out about each other.” aww no, I do feel bad anyways. Think of this: depression=great literature. You had a wonderful childhood, so this is compensation. That dog competes with my leathery French lady for scary blog picture of the decade. That dog looks.li life a.bitc. That dog needed a warning! I’m reading this in the dark! Alone!